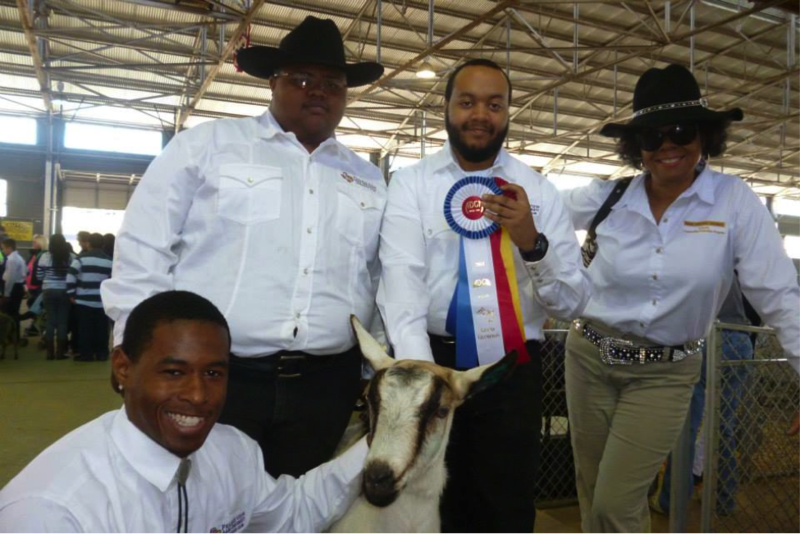 In the first time that Prairie View A&M University has competed at the Fort Worth Stock Show and Rodeo in the Dairy Goat Competition, Prairie View’s Livestock Club members Robert “Woodie” McClennon, Theo Reed and Bryce Peterson, along with advisors Scott Horner and Dwight Rhodes brought home 1 reserve champion and 3 champion ribbons. The winning goats were a 7 year old Alpine milking doe named Agalea, shown by Brice Peterson; a 2 year old Alpine milking doe named Bree, shown by Woodie McClennon; and a dry yearling Alpine named Caryn also shown by Woodie McClennon. The team also showed the second place best 3 females in the show that had over 200 goats competing. Following through on the partnership with Dallas County’s DeSoto Independent School District via the One Kid at a Time project was the project’s lead principal investigator, Dr. Joice Jeffries, standing on the side lines to cheer on both the DeSoto students and the PVAM youth that were participating at the Fort Worth show. The Livestock Club worked closely with the students from the DeSoto ISD middle school, mentoring the youth that are participants in the One Kid At a Time Project. Club members helped the youth with the final show preparation, grooming of their goats and worked with them to show how best to exhibit their animals. The middle school youth fared well, showing their goats to many middle and upper class placings in a very competitive show. This entry was posted on Saturday, February 8th, 2014 at 11:52 pm and is filed under Agriculture and Natural Resources, College of Agriculture and Human Sciences, Cooperative Extension Program. You can follow any responses to this entry through the RSS 2.0 feed. You can leave a response, or trackback from your own site.